Document approval lets you set up quotations, rental agreements, delivery notes, or other opportunity documents with buttons to accept or decline, and comment. To get started, go to System Setup > Document Layouts and find an opportunity document that you’d like to turn on approval for. Click the blue arrow next to it and choose Edit from the menu. Toggle “Use this document for on-line approval/publishing?” to YES to access your options. Set to YES to capture a signature when this document is approved. The signature capture in Current RMS is primarily designed for capturing proof of delivery or collection. You might like to use it for signing quotations and rental agreements, but keep in mind that the signatures captured are not legally binding. 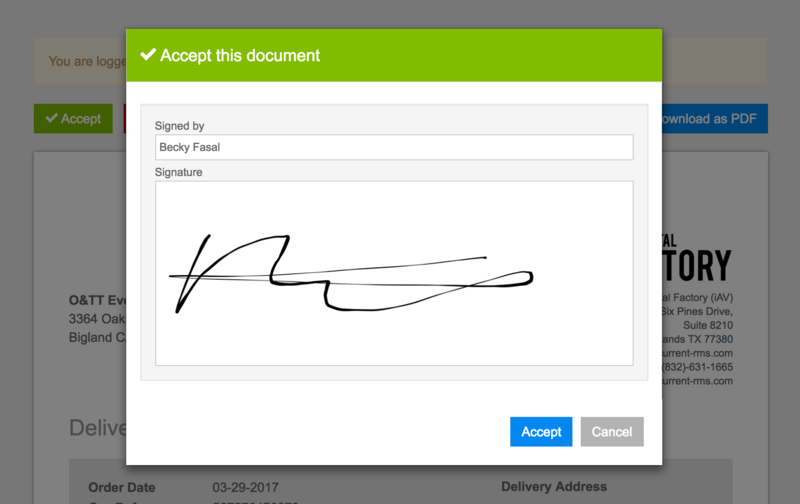 If you need to capture legally binding signatures, we offer an integration with Adobe Sign that you can use. Set some text that your customer sees when they accept or decline a document. Use custom fields to build an approval form that appears on the acceptance screen. For example, you might like to capture an up-to-date contact number or information about the venue. Hit the green add a custom field button and then choose any of the custom fields that are set up for the opportunity module here. When a document is approved and custom fields are selected, the custom fields against the opportunity are updated. Where is the signature added? If the document is a default with a signature block, the signature is inserted there. If there's no signature block on the document, one is added automatically.